Vital records (births/deaths) were not kept in North Carolina on a statewide basis before October 1913. For most counties, microfilm indexes of births and deaths (1913+) are available to researchers who visit the State Archives of North Carolina. Detailed information about holdings may be found in the County Records Box Lists of the State Archives of North Carolina. County Register of Deeds offices house birth and death records and marriage licenses for their counties. Check with the county register of deeds office to learn if deeds are available online. North Carolina Birth Index, 1800-2000 – Includes Delayed Birth registrations extending back into 18th century; these require documentary proof of birthdate or age, birthplace, and parentage from other records and must identify contemporary owner of family Bible if presented for proof. Durham, Wake, Forsyth, and Dare counties are not covered. North Carolina Death Collection, 1908-2004 – Index; some entries include Index Images from microfilm copies of county death indexes. 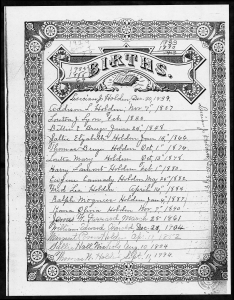 North Carolina Death Certificates, 1909-1975 – Images of certificates, including stillborn and fetal deaths. North Carolina Marriage Bonds, 1741-1868 – Index; bonds were not required by law. North Carolina Marriage Collection, 1741-2004 – Index, some images. Not all counties are yet included.